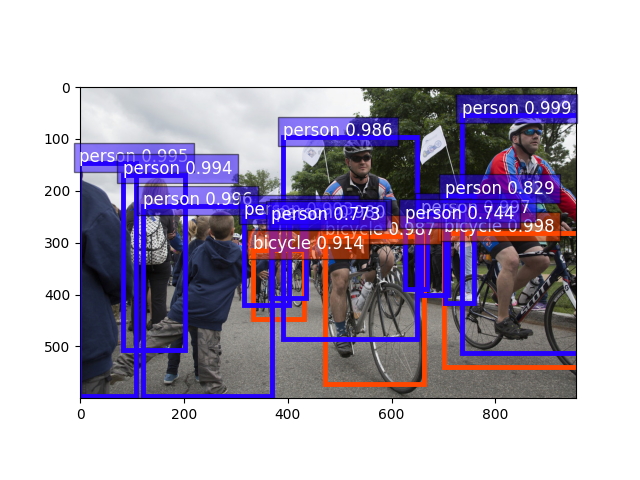 This article shows how to play with pre-trained Faster RCNN model. Let’s get an Faster RCNN model trained on Pascal VOC dataset with ResNet-50 backbone. By specifying pretrained=True, it will automatically download the model from the model zoo if necessary. For more pretrained models, please refer to Model Zoo. The returned model is a HybridBlock gluoncv.model_zoo.FasterRCNN with a default context of cpu(0) . Next we download an image, and pre-process with preset data transforms. The default behavior is to resize the short edge of the image to 600px. But you can feed an arbitrarily sized image. You can provide a list of image file names, such as [im_fname1, im_fname2, ...] to gluoncv.data.transforms.presets.rcnn.load_test() if you want to load multiple image together. This function returns two results. The first is a NDArray with shape (batch_size, RGB_channels, height, width) . It can be fed into the model directly. The second one contains the images in numpy format to easy to be plotted. Since we only loaded a single image, the first dimension of x is 1. Please beware that orig_img is resized to short edge 600px. The Faster RCNN model returns predicted class IDs, confidence scores, bounding boxes coordinates. Their shape are (batch_size, num_bboxes, 1), (batch_size, num_bboxes, 1) and (batch_size, num_bboxes, 4), respectively.